It’s that time of year when a lot of us are dreaming of getting outside, planting, and growing some edibles and ornamentals. 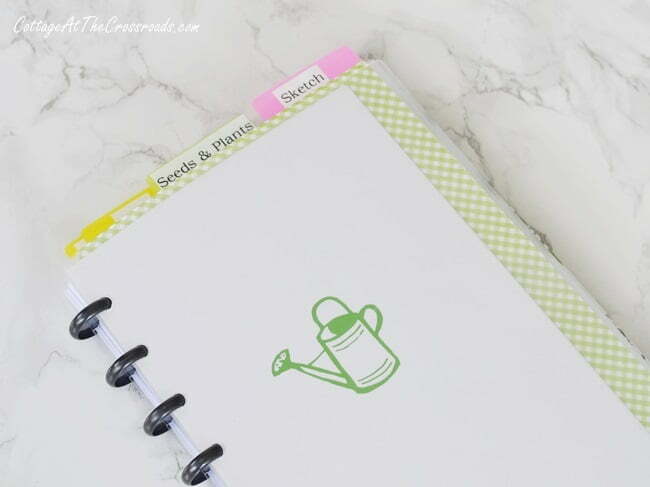 And if you’re one of those people, I have a post for you today that shows you how to set up a garden journal. *Some of the links used in this article are affiliate links. You can read more of our disclosure policy here. 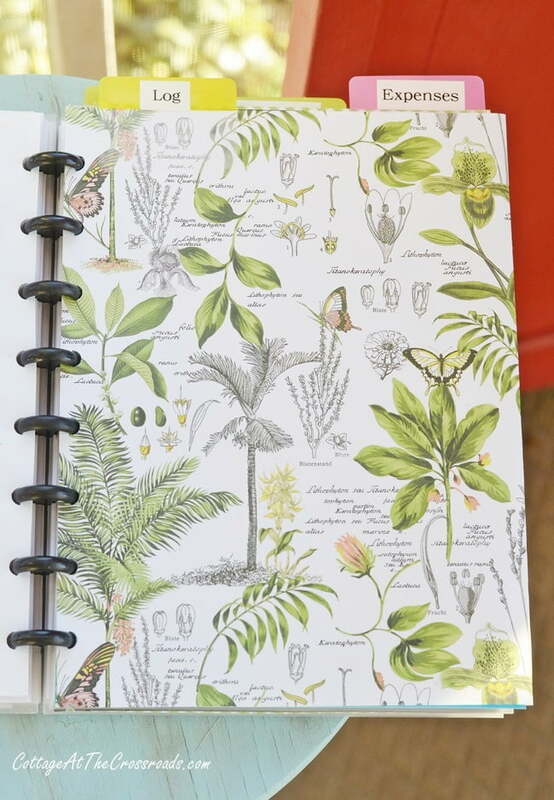 Why keep a garden journal? The obvious reason is so we won’t forget what we planted where! But more importantly, a journal helps you celebrate the successes as well as learn from the challenges of gardening. It also is a great record of what you do that can be shared with beginning gardeners or can become a valuable resource to the next property owner should you ever decide to sell. So no matter if you just plan to grow a few vegetables in containers, or do a bit of flower gardening, or landscape your property with some bushes and trees, today’s post about setting up a garden journal is for you. 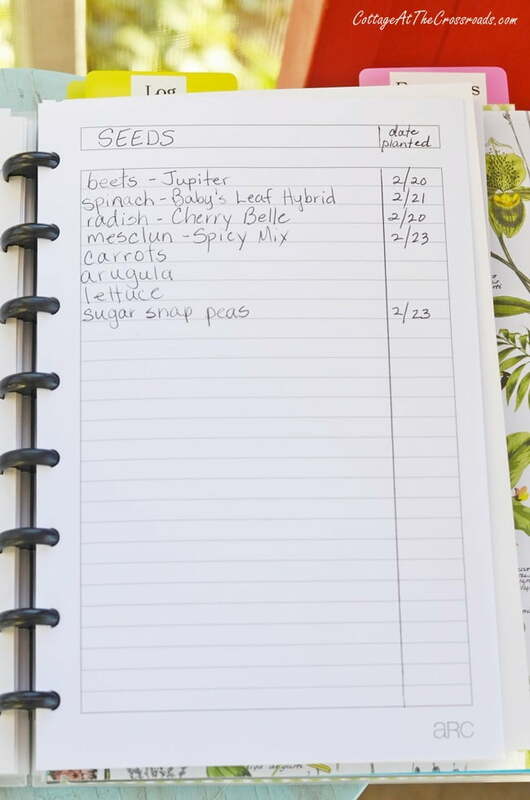 This is the perfect time to set up your garden journal. 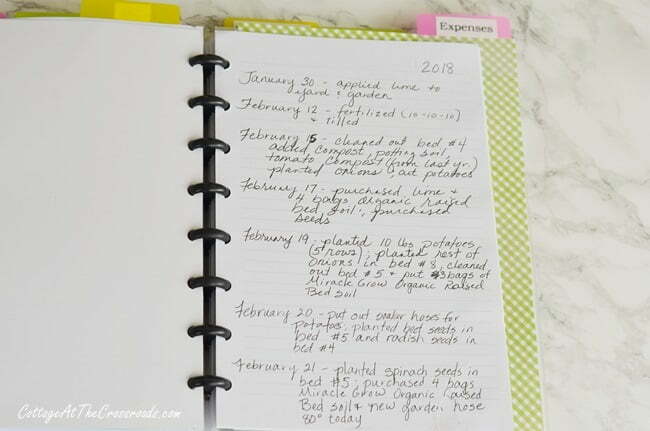 The spring gardening season is just about upon us so if you go ahead and create your garden journal, you’ll be ready for the growing season. There are about as many types of garden journals as there are types of gardeners! Some people keep a journal online or on their computer, but I prefer a small, hard copy that I can take out into the garden with me. 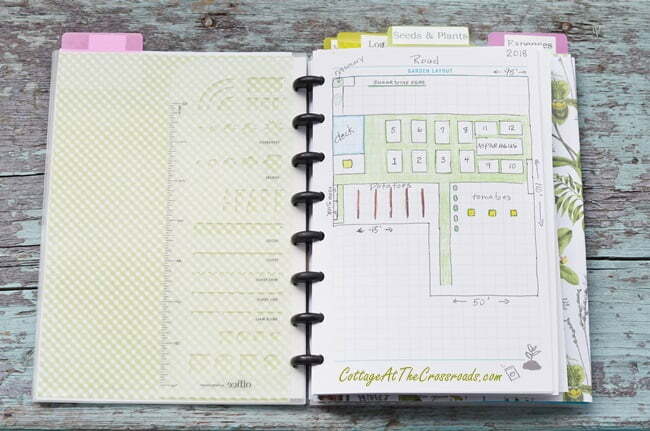 You can use a spiral notebook, a composition book, a 3 ring mini-binder, or a commercially prepared garden journal. There are many options available for purchase online, but I like to use one that I can add pages to as I need them. 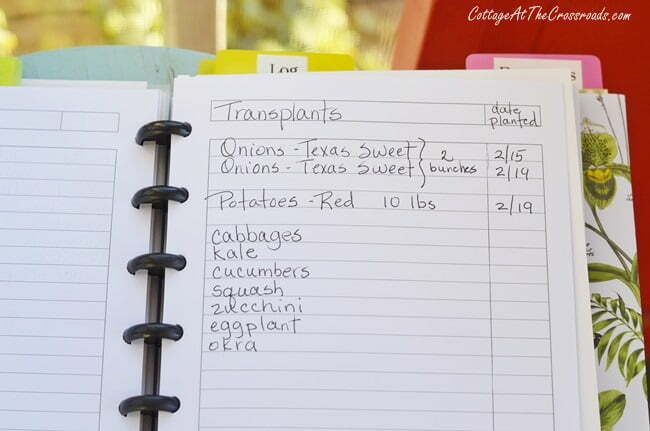 The first year that we started our vegetable garden, I used a simple composition book to record what we planted and it worked very well at that time. 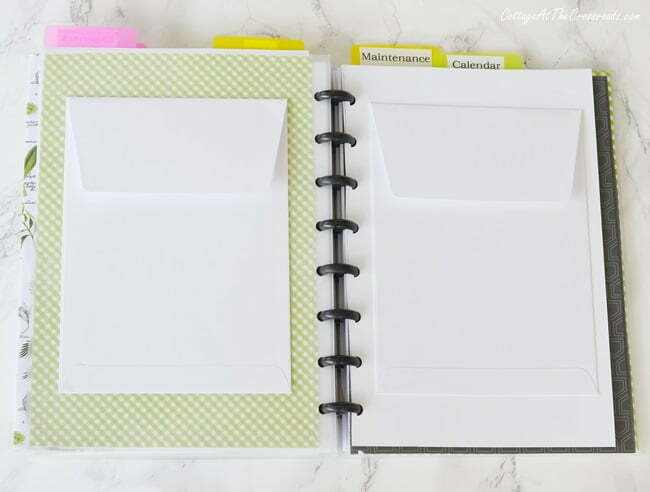 The journal that I’m showing in this post has a clear, durable poly discbound notebook cover with the Office by Martha Stewart discbound gardening insert refill. Both of those are in the junior (6 3/8″ X 8 3/4″) size. I just happen to be in love with the discbound notebook system that you can read more about HERE because they are so flexible. I can add, take out, and reposition pages as needed. But you can still follow my suggestions on how to set up a garden journal using any system or format that you prefer. 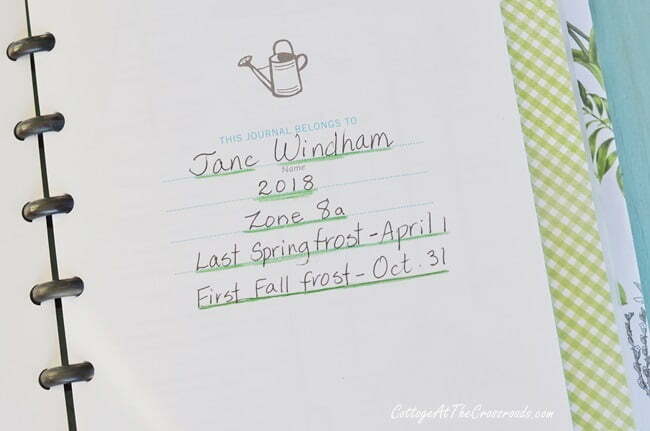 The very first thing that any type of gardener needs to know is their plant hardiness zone and their spring and fall frost dates. This crucial information is best kept in a journal for handy reference and if you notice, it’s the first thing I recorded at the front of my journal. 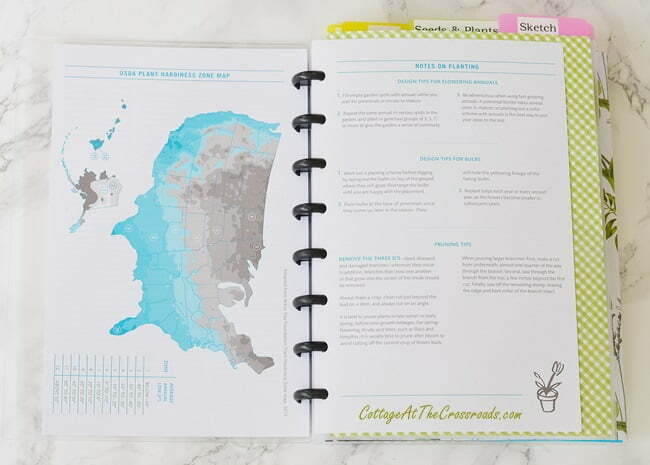 A plant hardiness map and some additional general gardening information came in the Martha Stewart gardening insert that I purchased, but you can find this information for your zip code HERE. I created the following sections in my journal: Sketch, Seeds & Plants, Log, Expenses, Calendar, and Maintenance. You may also want a section for photos of your garden so that you can record your progress. 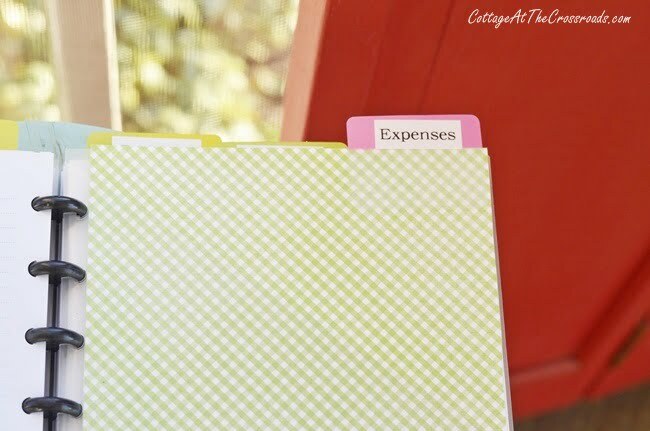 If we didn’t have a blog, I would definitely print photos on sticky back paper to include in my journal! 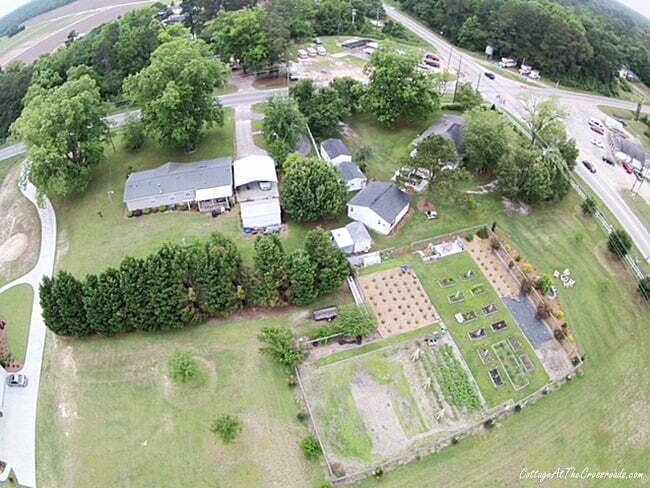 This aerial photo was taken by Leo’s brother Jim using his drone, and as you can see, we have a very large vegetable garden here at the Crossroads. 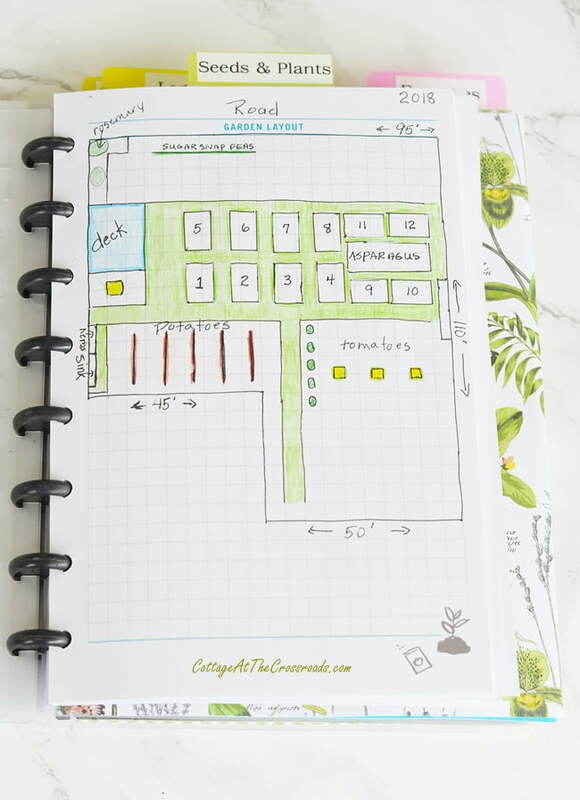 A sketch of your gardening area is very helpful for several reasons: to record the location of where things are planted, to plan for future plantings, and to determine the size/amount of what can be planted in your allotted space. The grid paper that was included in the garden insert that I purchased was handy in helping me sketch our garden but it’s not absolutely necessary. 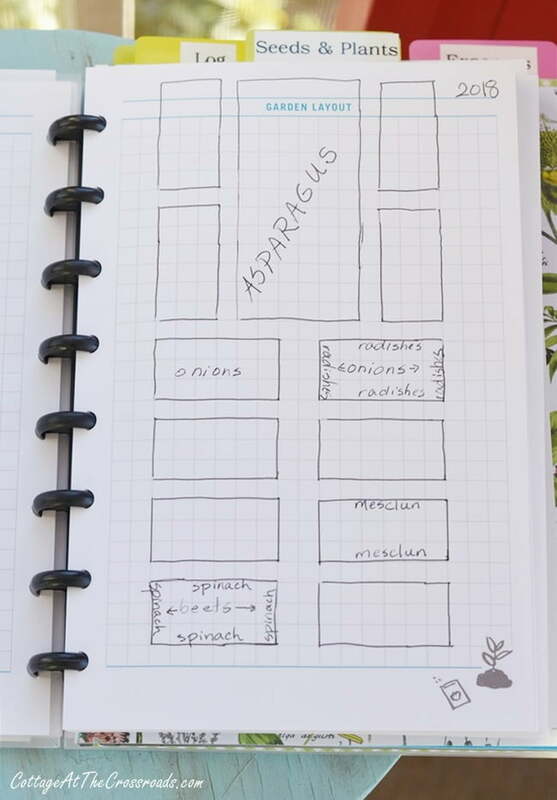 If you are a vegetable gardener, a sketch helps you plan where to put your crops in advance, especially if you are trying to be mindful of good crop rotation practices. In our raised beds, we plant both seeds and transplants. In this sketch above, I am recording where we have planted both which eliminates the need for garden markers. Whether you are using containers, raised beds, or in-ground planting, having a sketch helps you determine how many seeds or plants you need which may save you money in the long run. The space you need for each plant is easily obtained from the seed packet, the plant label, or online. If you have never gardened before, sketching your property will help you determine your shady and sunny areas as well. 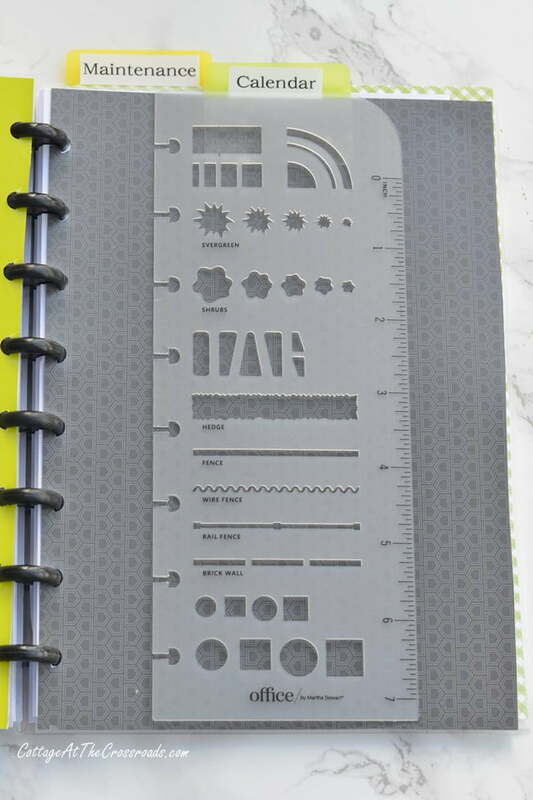 This garden sketch tool and ruler was included in the garden insert that I purchased. It came in handy but is not absolutely necessary. The next section in the journal is Seeds & Plants. To create the divider page, I cut apart an old folder and used my ARC paper punch to make my own holes. Whether you are a flower gardener or a vegetable gardener or both, you will want to make a list of seeds that you want to plant. Be sure to record the exact variety and the date when you planted them. Next I created a Log section. The divider page was made by cutting up an old folder and then gluing this pretty paper onto it. The good thing about creating your own garden journal is that you can be as creative as you like. 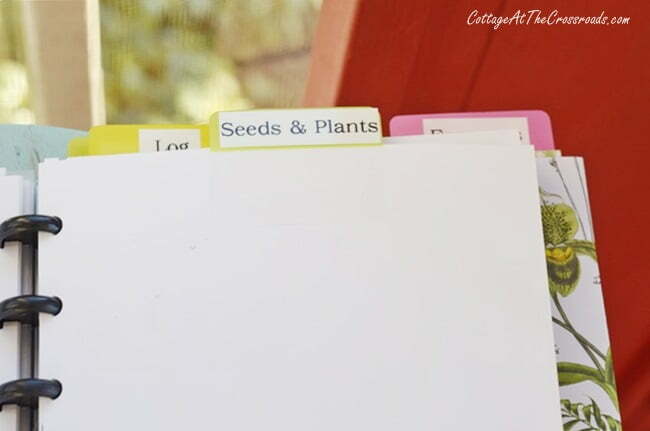 The purpose of this section is to have a running log of everything you do in your garden such as adding amendments to your soil, what fertilizer you used, weather and temperature notes, etc. It’s great to take these kind of notes while you are out in your garden. If your cover is not waterproof, then just keep it in a plastic baggie for protection. Nobody likes to talk about money, but gardening is NOT cheap, especially if you are a first time gardener! There are tools to buy, soil amendments to purchase, construction expenses (if you’re building raised beds,) seed and plant costs, etc. You can’t see it is the above photo, but this divider page has a pocket for receipts. And the garden insert that I purchased came with these paper pockets that I glued down onto some of the pages in this section. Keeping receipts helps you determine if your gardening efforts are worth it, especially if you are growing your own food. But can you really put a price on the taste of homegrown food? Or the health benefits? I say no. I included a calendar section in my journal. 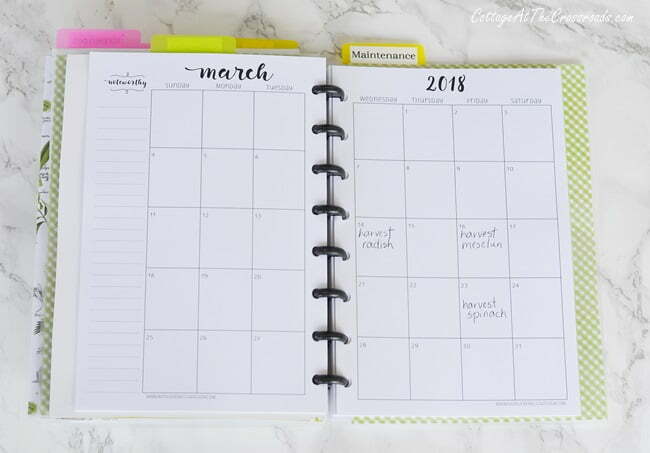 I used a preprinted one that fits into the discbound junior size notebook, but you could easily print off some calendar pages and glue them inside your journal. Using the information on seed packets or plant labels, you can calculate your harvest dates and put them on your calendar. Looks like I’m going to be making lots of fresh salads in March! Last, but not least, is the maintenance section. 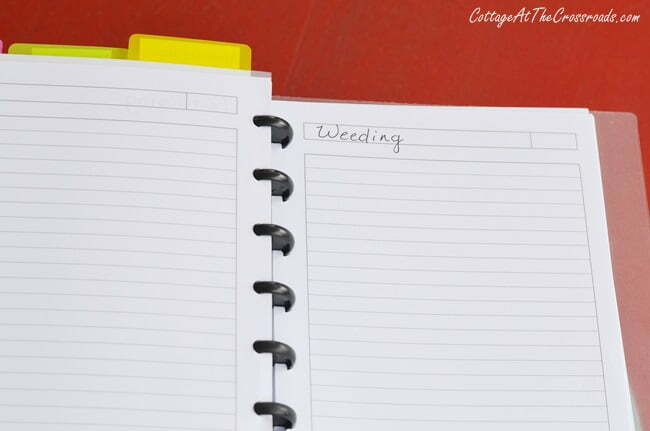 This is where you will make notes about all the things that it takes to have a successful garden: weeding, watering, fertilizing, controlling pests, harvesting, etc. For example, here is my page for weeding. This is where I would identify what kind of weeds I have and what I used to control or eradicate them. This is good information, especially if you’re using homemade or organic solutions, and you can note whether they worked or not. 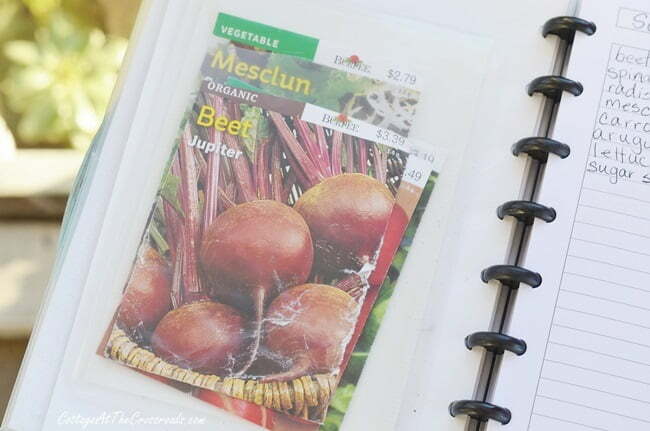 Keeping a garden journal is part of the whole gardening process. It’s a place to keep records, plans, notes, and anything that relates to your garden. It documents your successes and helps you learn from your mistakes. You’ll find yourself referring to it from year to year with a sense of achievement and satisfaction. 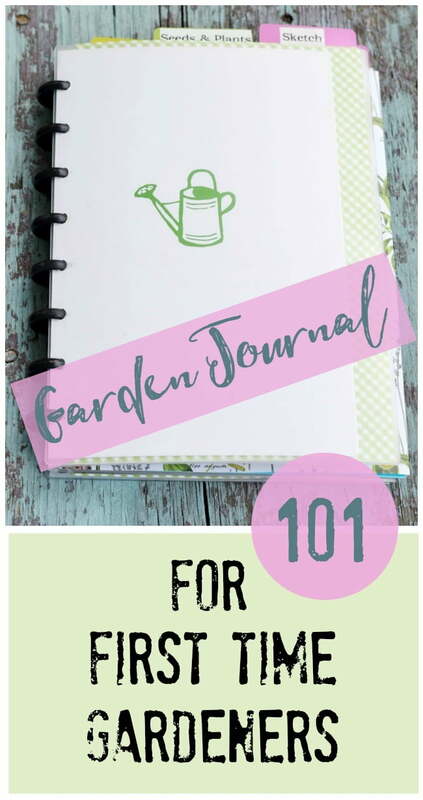 If you’ve gotten some ideas from this post about how to set up a garden journal, do me a favor and pin this to help others who may need some direction, too! Thanks a bunch! Enjoy planning your garden while we wait for the arrival of spring! Be sure to follow us on Pinterest, Facebook, and Instagram. 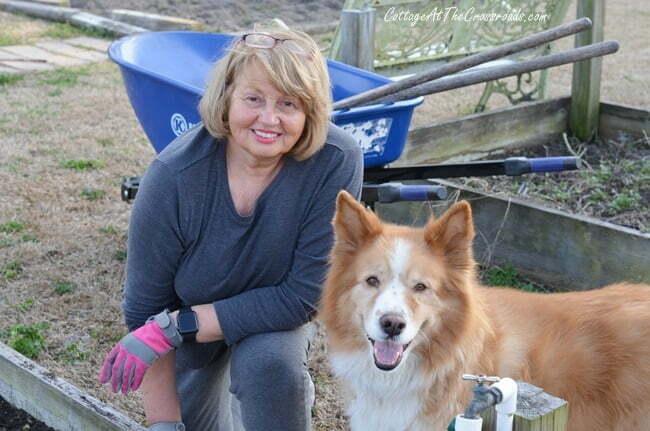 I’ve added all the products mentioned in this article along with some helpful gardening books to our shop on Amazon for your convenience. I grew up on these recipes. To me, they are comfort food. The sugar creaM pIe can alSo be made With buttermilk, adding a little melted butter , an egg, and vaNilla. The necessity of making every scrap count teaches a deeper respect for food and the love that goes into making it enough. Thank you for doing what you caN to keep these traditions and this american hardiness alive. I have read your article. 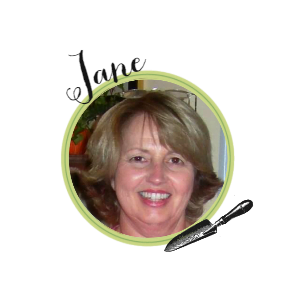 It is very informative and helpful for me.I admire the valuable information you offer in your articles. Thanks for posting it! Thanks! Anything to help people get growing! Very interesting post. I love to keep up with things, but have never been as organized as this. Sandy, some years are better for me as well! This year I plan to stay on top of entering info in the journal. I am not at all artistic – cannot even draw a good stick person. 🙂 But I do have a garden journal. I used a 3 ring binder and plastic page protectors. On a sheet of notebook paper, I tape the tag (and receipt) from the plant. I then write the name at the top and list all the information about the plant, including where it’ planted, water, light, & other needs. When to prune and the date. And anything thing else I think I might want to remember. It’s not fancy or even very pretty, but it works well. Oh, I also named my different garden areas to easily identify where I planted things. I have a patio garden, herb garden, pool garden, flower garden, woodland garden and retreat garden. That’s pretty much what I did the first year, Elaine. I’m so glad I have those tags from the plants that we put into our bed in front of the garden. Making notes about when to prune is such a good idea. Thanks, Jane, for sharing your journal. So helpful and am going to try to develop one for us. Thanks Mona! If I don’t keep a journal, I just can’t remember from year to year what was planted in each area. WOW – what a garden!! Sadly I hate to garden, hate the dirt, bugs, little slithery snakes, and so on!! I just need a gardener so I can reap the benefits!! In all of our years of gardening, I’ve only seen one snake! Luckily, he was already dead so I didn’t have to change my clothes afterward!